I wasn't planning on writing a blog this week because my 2 year sober birthday is coming this Monday on the 13th, and I really want to write about what that means to me. But today a few things happened that reminded me of this journey I'm on and how I got here. I can still write on Monday, but I need to share this right now. Today I had to hire someone to remove a behive, normally I would just leave it alone but it was growing and in an area that might not be safe for people. So I made a call, they arrived and did their thing. At one point everyone stood around amazed at the bravery of this young guy handling the hive, but eventually we all went back to doing whatever we were doing. About an hour later one of the staff had me try some of the honey from the honeycomb. It was incredible, I've never tried pure honey like that before. I took the above photo shortly after and it got me thinking about bees and beehives, so I did some research. Now of course there are too many metaphors and symbolisms to review, but the few that grabbed me, made me stop. It made me understand why this all worked for me this time and what I need to get in order for it to continue, and especially what I need to contribute to keep it going for myself and people like me. This isn't just a recovery, addiction story, this is everything. We are artists, storytellers, musicians, poets, writers, teachers, entrepreneurs, creators, inventors. We are also people with addictions or have a history of abuse or suffer depression, we live in self doubt or maybe fear we are alone and unique in our suffering. We are not alone. The failure of my recovery in the past was in part that I didn't want to be a burden to others, I thought I could do it alone. I also did not surrender myself because of fear of being too vulnerable to others. These two things stopped me from living and creating, they stopped me from learning and sharing with others. If I feel I'm alone and no one understands my problems then I remove my chances of meeting people like myself. The last two years in recovery have proven to me that this program only works as a fellowship, we need each other. Isolation kills hope and feeds fear. Recovery worked because I completely surrendered myself and understood that before anything, my recovery had to be the most important thing. I had to stop worrying about what other people thought, or about fixing all of my problems from the past at once. The support of others that traveled this road before me gave me hope, they showed me a better way. They gave me a safe haven free of judgement and they encouraged me to take all the time I need, all I had to do was show up. Recently, I experience the same concept at the Ubud Writers and Readers Festival, actually I really felt the power of this when I was on stage at my first poetry slam. As I patiently and nervously waited my turn, I was enveloped in the words coming from each and every poet that went before me. Taking mental notes on how they carried themselves, their message, hand movements and the power of their voice. I snapped my fingers when I heard something that was powerful to me, things I related to. I then took the stage and shared my story, I was vulnerable, then that moment happened when they snapped their fingers letting me know I wasn't alone. This stage is a place where you can share anything, free of judgement, a safe haven for you to express and inspire others. To remind people they are not alone, this is when we speak for those who can't until we can inspire and help them share their story. A community that is there just for you, that is it's purpose. The purpose of the bees nest is comparable to a birds nest, built with a purpose to protect the dweller. The bees cannot live apart from the operation of the hive, alone they would die. If I kept my poems in and never shared them I wouldn't be able to heal, I would never be able to inspire and that one person wouldn't get to hear their story through mine. 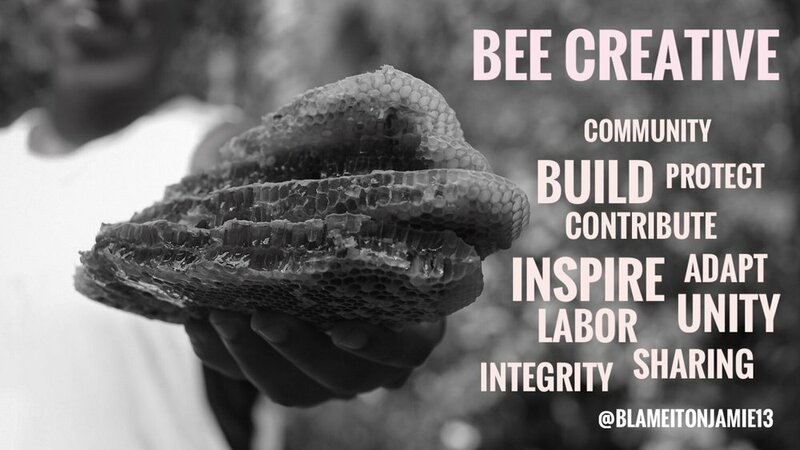 The bees work together with the purpose of working towards something greater. We are stronger together, in everything we do. 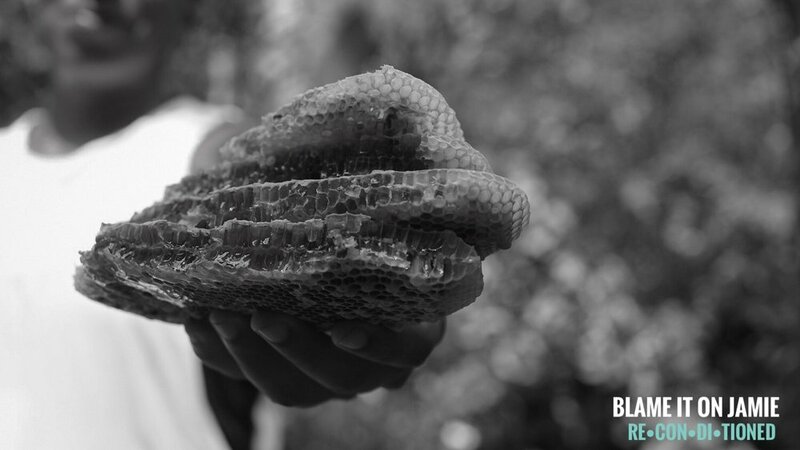 Together the bees worked hard with engineering precision and manufactured a honeycomb that produced delicious honey. Just like we do in life, we work hard to work towards producing something better. But we can all learn from others, and thats what I want to share. We are only stronger as a community and many people know that, some resist, but I believe we can get there. Our small groups will become big if we remember just a few things. These are just a few that are important to me and remind me of the kind of person I want to be. We all know what these words mean but I believe we need the reminder, we may forget how it really relates to our life. I want to acknowledge my BEEHIVE / COMMUNITY / FELLOWSHIP that has protected me and helped me grow over the last 2 years. I also want to say I'm ready for the many communities I have been so graciously welcomed into. My journey is exactly what its supposed to be. So Be Creative, Join a community and Contribute to the well being of others like you.